Precision horticulture has evolved at great speed during the past decades. It will have a major influence on the world’s food supply, because of the quality and versatility of its produce. Modern greenhouses are closed, preventing the entrance of pests, and allowing total control of the interior climate. The air is enriched in CO2, in order to enhance plant growth. Plants do not grow in soil but in a clean substrate to which the horticulturalist circulates all necessary ingredients, organic and inorganic. This is the fifth article in a series on the forthcoming book by Alle Bruggink and Diederik van der Hoeven: More with Less, Welcome to the Precision Economy. The articles appeared on 30 October and 2 November 2016, and 24 January, 14 February, 18 March and 30 March 2017. Horticulturalists always look for new markets. 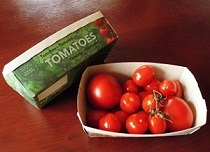 Tomato trays can now be made from stems of the tomato plant. Take tomatoes. Precision sensors continually monitor tomato plants and fruit; they report greenhouse climate and lighting conditions, growth patterns and ripening; they signal any irregularities like bruising, insect attacks and discoloration. Attacks by diseases and pests are countered by biological means, rather than by pesticides. Precision plant breeding methods (GM-led but traditionally bred) produced varieties resistant to common diseases like the tomato mosaic virus, mildew, botrytis and fusarium. Predator insects control pests like whitefly, thrips and spider mites. Horticulturalists make use of these predators only if and insofar as they observe these pests. Precision methods based on pheromones control pests like tuta absoluta. Precision horticulture continuously reduces the use of chemical pesticides; the aim is to reduce this to zero. Precision breeding also contributed to commercial value, producing new tasty varieties like the clustered tomato, the beef tomato and the cherry tomato (for all this: search here for tomato). In precision horticulture greenhouses, climate and lighting are controlled. Photo: Philips Lighting. It required a crisis to set the horticultural branch on this innovative pathway. Dutch tomatoes used to be mass produced, more with an eye on cost than on quality, and they came in one size and one colour: perfectly round and bright red. Around 1990, German consumers got weary of them, starting to call them ‘water bombs’. At the same time, Dutch government could no longer maintain low gas prices for the horticultural sector. Threatened from two sides, Dutch horticulturalists embarked upon an innovation wave. They now reduce energy use in an ambitious program called ‘The greenhouse as an energy supplier’. This includes precision strategies like precision lighting and growing patterns tuned to energy use; and measures like better CO2 supply and ground-source heat pumps that heat ground water in summer and extract the heat in winter. On top of that, the sector embarked on an ambitious program of water use reduction by drip irrigation and water recycling in closed greenhouses. Traditional Dutch greenhouses used 22 litres of water for the production of 1 kg of tomatoes; this has now been reduced to just 4 litres. Contrast that to Spain and Israel: 30-60 litres. In sum, Dutch horticulturalists succeeded in producing more with less: better tasting tomatoes, using less energy, less water and less pesticides. Because of precision horticulture, Dutch tomatoes now have a much lower footprint than 25 years ago. And in 2012, the Netherlands became the main tomato exporting country in the world, beating Mexico, the home country of the tomato. Dutch tomato exports then amounted to € 1.4 billion. Together with their Flemish colleagues, who followed a similar development pathway, the Dutch now dominate the important and quality sensitive German market. 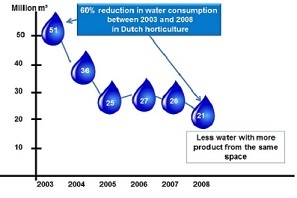 Dutch horticulturalists have been very successful in water efficiency. Many companies now develop mini and micro LED-lit greenhouses that will put fresh produce on many customers’ tables. Growth substrates are fully reusable or recyclable. Addition of microbial nutrients or biological plant protections to the water feeds or to the growth substrate will further increase productivity. Such greenhouses are multi-layered, like mushroom stacks in cellars or grottos. Each layer can grow another vegetable. 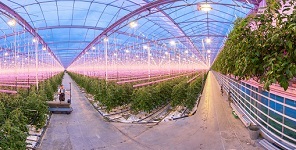 LED lighting is adjusted to the crop in question, the plant will only receive light of the wavelengths it requires, adapted to the species and the maturity of the plant. Admission of nutrients, minerals and water is fully controlled, water is recycled. In the near future, companies will sell turn-key mini greenhouses, with seeds, substrate, minerals, and a manual or even a computer program for process fine tuning. Restaurants may be the first major customers of such mini greenhouses, making sure that they can always serve the freshest vegetables of the highest quality possible. Supermarkets, or a group of supermarkets in a neighbourhood, might be the next customers. We foresee precision horticulture in vegetable warehouses, serving maybe up to 10,000 or 20,000 consumers, in vacant offices or on urban wasteland. Packaging and transport of products will be a lot simpler, and the producer will always guarantee fresh quality. With proper sensor technology and automation, supermarket managers can deliver fresh vegetables as accurate as within just a few hours. From their computers they can check the availability of fresh lettuce, tomatoes, mushrooms, strawberries or any other vegetable or fruit from the next door vegetable growing ‘office’. The relatively limited scale of these operations allows for transparent control. The greenhouse company will also service its products, supplying biological and chemical pest control, and equipment repair, as required at short notice. Supermarkets can easily introduce new cultivars and product varieties. The greenhouse company just needs to supply supermarket managers with the details of the product variety and the required growth parameters. There is no need to apply large scale production facilities to reach acceptable business economics, as modern consumers are pleased to see the greenhouses around the corner and understand the benefits of less transportation. Greenhouses could very well develop into a sustainable biotope of their own. In short, better food production can grow spectacularly in just a few years through precision technology. Whereas the Netherlands are the starting platform for these developments, we should closely look at big cities in China as Shanghai, Hong Kong and Beijing to see this to come true. Important social trends support such a development. Modern consumers demand transparency in the food chain, a need that is fully served by neighbourhood greenhouses. Consumers will be able, so to speak, to see the vegetables grow around the corner. They will have direct contact with the producers, and can check the details of the produce at any time. Their demand for fresh vegetables, high quality and good sustainability in the production process will be easily met. The entire scheme may help to restore trust in the food chain, a quality that is much looked for but that is threatened from many sides. On the one hand, people go at great lengths to find trust in society; and on the other hand, in the food chain, there is an utter lack of transparency that undermines trust, and an uneasy feeling that food producers will do anything to make a profit. Neighbourhood greenhouses may be an element in restoring this quality of trust to society. Vegetables and plant based food will be the first to restore confidence and transparency between user and producer. We propose the precision and productivity of modern greenhouses to be a model for future agricultural practices world-wide, ‘precision agriculture’. The potential of precision horticulture to feed 10 billion people can hardly be underestimated. 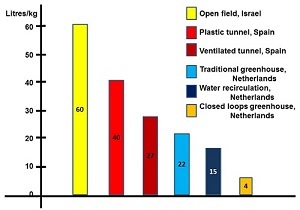 Firstly, an increasing proportion of our food is produced in greenhouses: in the Netherlands, this type of horticulture provided 14% of agricultural output 50 years ago, now this amounts to 40%. This 40% of output just requires 10% of all cultivated land. Therefore, greenhouses may greatly multiply agricultural productivity in densely populated countries like China: the Netherlands produce 20 times as many tomatoes per hectare than China, 10 times as many paprika and even 40 times as many cucumbers. Greenhouse culture may have to be adapted to the Chinese menu and taste, but still the potential increases in food production would be enormous. And finally, precision horticulture may provide the lead for precision agriculture on the land, and guide it away from the negative effects of the Green Revolution.